The lithium-ion battery (LIB) offers many benefits when used in conjunction with data center uninterruptible power supply (UPS) systems. Industry experts are predicting lithium-ion batteries have the potential to revolutionize data center facility design. Still, data center professionals have legitimate questions about the operational and safety aspects of this emerging technology and how it compares to traditional valve-regulated, lead-acid (VRLA) batteries. Lithium-ion batteries systems are being paired with uninterruptible power systems in data centers throughout the world. Experience from those applications combined with fast-improving technology and new safety standards and codes make lithiumion batteries a highly appealing energy storage solution for infrastructure professionals. This paper reviews the advantages and disadvantages of LIB compared to VRLA in UPS applications and presents an overview of the codes and standards related to applying LIB safely within the critical infrastructure industry. Vertiv hopes to show this is a technology that is proving safe and eff ective when properly applied. 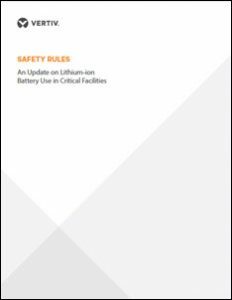 Download the new white paper from Vertiv that addresses common questions about the use of lithium-ion batteries in the critical space.